All educationists will agree on the immeasurable value of reading. Given the budget spent on education in our country, it is no small feat that there is a provision for expenditure on a library for all government schools. 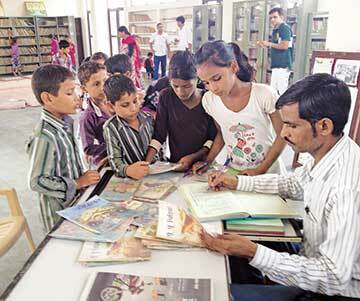 Taking the DISE 2014-15 data, for Rajasthan, of around one-lakh schools covered, around 69 percent have a library. Of these, around 21 percent schools (secondary and higher secondary) have a librarian. This article is about a library at Digantar, an NGO school, located on the outskirts of Jaipur, founded by Rohit Dhankar and Reena Das Roy in 1978. There were seven multi-age, multi-level groups in the primary section. Each group had one library period of 40 minutes every week. I observed eight such library periods across different groups. The librarian primarily conducted the library period, but the group teachers were also present. Half of the observed sessions had storytelling, whereas in the other half, the students selected some books and read independently. The librarian told me that other library activities included sewing book covers, rearranging books, etc. The library was a spacious room, where the children, the group teacher as well as the librarian sat in a circle, on floor cushions, for reading as well as listening to stories. It was a very well stocked library with 12000 children’s books, 7000 reference books and 5000 magazines (15-20 titles). Books were mostly in Hindi and English. Few were also available in Urdu and Sanskrit. The library was indicative of the common, easily accessible, wealth that the school had built over its 37 years of existence. The stories narrated by the librarian were heard with a lot of interest across the sessions observed. The librarian engaged the students in a short conversation before and after the story. He usually started by asking – “Do you know what I am going to narrate today?” The stories were closely connected to the everyday lives and interests of the children and included characters like thieves, animals, kingdoms, friends, etc. The story was not read out from a book but narrated orally. The librarian also shared that he improvised during the narration, depending on the students’ responses! After he completed the narration, he asked the students for an appropriate name for the story, an alternate ending, or their feedback. The children were seen to participate enthusiastically by answering these questions. Interestingly, apart from stimulating imagination, encouraging concentrated listening, etc., this activity also fostered the possibility and acceptability of different answers. E.g. after a story session, students volunteered by giving various names to the story like ‘Shaitaanbandar’, ‘Harkatbandar’, ‘Mazedarhalwa’ and all were ‘right’ answers. No answer was wrong. There were bookshelves all around the room, with neatly segregated books into basic broad categories such as English books, Hindi books, children’s magazines, etc. The books were not segregated by the children’s level of learning, and all children were free to choose whatever they fancied. The simple categorization made it easier for the students to browse through. They were given 5-10 minutes to select a book, every single time. The group teachers and the librarian helped, if the child requested for assistance. However, borrowing books wasn’t compulsory and not all children took a book home. The books could be returned any time during the week and exchanged for newer ones. The students were encouraged to use a part of their hour-long lunch break for the same. 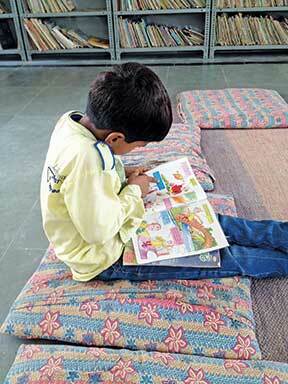 Children in the primary sections mostly chose Hindi storybooks and magazines. Often, children could also be seen reading a magazine – looking at pictures, optical illusions, reading jokes or solving puzzles together during the breaks. It was a truly inspiring sight! The borrowing data was also very encouraging. From mid July to end September 2015, it showed that 30, 33, 163 books were borrowed by the three smaller groups (5-7 year olds), 393 books borrowed by the middle group (7-9 year olds) and 425, 427 and 480 books were borrowed by the three older groups (9-13 year olds). Interestingly, the lower number of books borrowed (i.e., 30 and 33) in two smaller groups was discussed in detail in one of the teachers meetings. It was found that new teachers led these groups! They were surprised by the data of the third smaller group and questioned the usage of storybooks for children who could not yet read by themselves. The other, more experienced teachers shared numerous ideas and stressed on the importance of using storybooks even for 5-7 year olds. Suggestions given by them included using more picture books, books with very little text and more pictures, combining stories with discussions and art. The academic coordinator also recommended that the new teachers should read a few articles by Prof. Krishna Kumar on the same topic. Another interesting aspect was that the library at Digantar went way beyond the library itself! During the Hindi and EVS classes, the teachers often used storybooks and gave different tasks to the students based on the stories. E.g., write the story in your own words, make a few questions from the story and so on. During the EVS classes, the storybooks were used to foster discussions. E.g., around Independence Day, students were first encouraged to read books around that theme and then share their understanding with the whole group. This was in line with the NCF 2005’s suggestion of going beyond textbooks. Teachers from two out of the three groups, that I observed, shared that they used material other than textbooks at least three times a week!! Digantar, also publishes ‘Batuni’, every month. ‘Batuni’ had the children’s own contributions in the form of stories, poems, and drawings. This magazine was also circulated widely in the nearby schools. The students shared their world with a much larger and real audience. According to Delpit (1988), this is an essential ingredient in inculcating the feeling that the children’s voices are important. The daily assembly also encouraged the students to read more as it gave the opportunity to students to share whatever they had read-in the form of stories, jokes, songs, riddles, poems and so on, with their fellow students and teachers. There was no recommended book list. Ms. Roy said that no books had been weeded out till date and the purchase of new books was dependent on the budget available. The idea was that all kinds of material should be available for reading. A genuine desire for reading was observed amongst the children at Digantar. This success was strongly fostered by the school’s philosophy where an important aim of primary education was to make children into independent and motivated learners. What could be a better start than to initiate them into the magical world of books?! The author has completed her Masters in Economics from the London School of Economics and an M.Phil. in Education from TISS, Mumbai. She can be reached at urvashinangia@gmail.com.